The New AFL Project in Lathlain Park in Perth’s inner-southern suburbs is a state of art sports training facility for West Coast Eagles and is intended to enhance the performance of the football club through training ground designed to engender team spirit and to meet elite level sports training requirements. This huge project formed over three storeys with external façade lighting includes administrative offices, Auditorium, Meeting rooms, gymnasium areas, pool area, Retail shop, Cafes and Sports science areas. DaRa Switchboards Team were subcontracted to provide Main Switch Board( 4000 Amps and 50 KA Short circuit) designed back to back for space optimization , Insulated Bus Bars ,12xDB’s ( maximum rating 400 Amps and 50 KA Short Circuit), 2x UPS output DB’s completed in a record 5 weeks time. 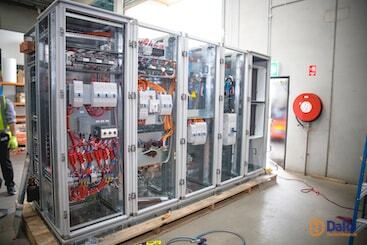 DaRa utilised a team of 15 highly specialised Engineering staff to manufacture the Switchboards with a tight schedule and supplied to the site in October 2018.